The world's most downloaded mobile racing games are back! 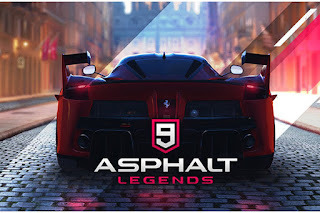 Gameloft, the leader in mobile game developer and publishing, soon launched Asphalt 9: Legends, the latest entry in the award-winning Asphalt franchise. Asphalt 9: Legends brings back the fun of arcade racing games that make it successful and takes it to the next level, blurring the line between mobile graphics and consoles and integrating powerful multiplayer and social features. Asphalt 9: Legends brings high graphics quality to mobile devices that have not been on any console before. The powerful new engine developed by Gameloft produces high dynamic range (HDR) and physical-based rendering (PBR) graphics, providing every detail of light enough to reflect as it does in real life. The attention to detail combined with the iconic location and the most prestigious car in the world makes it an incredible immersive experience. Asphalt 9: Legends puts players in the driver's seat when they do incredible stunts (big nitro boost, 360 ° finish, roll, etc.) when running through stunning locations. Asphalt's recognized gameplay is reproduced in Asphalt 9: Legends with Touchdrive ™, a new approach to controlling controls that adds pleasurable fun from driving and racing. Using Touchdrive ™ or classic controls, it gives players a different experience into their own blockbuster experience as they drive through the track, with dynamic environments in action. "With over 650 million downloads for the series and growing, Asphalt is the leader of mobile racing games. With Asphalt 9: Legends, our goal is to fly our 14-year-old community with pure arcade explosions while also changing gears for a new generation of car racing games, "said Alexandre Pelletier-Normand, Executive Vice President, Production at Gameloft. "The high octane action that comes with the Asphalt name will challenge the driver with an inclusive racing experience and we can not wait to see them refine their skills, prove their worth, and become a legend." 1 Response to "Asphalt 9: Legends Ready to Present on Android and iOS"
This tutorial is projected for anyone attracted in beginning Android development on Eclipse using the Android development tools plug-in. It offers insight into the salient features of an Android app, along with a brief explanation of its basic components.